Giardiniera, or mixed pickled vegetables, are usually referred to in Italy simply as sottaceti, literally meaning "under vinegar." They often appear as part of a standard Italian antipasto misto, and they also work very well with boiled meats in the winter months. It would be better to store it in several smaller jars, rather than one large one because the contents of an open jar lose their freshness. Select jars with lids that seal well and (optional, but handy) the little plastic mesh depressors that keep the contents of a jar submerged. This recipe does not require processing in a hot water bath because the vinegar-brine solution is all that's necessary in this case to preserve the vegetables; be sure to use a good-quality vinegar for the best results. Pour the vinegar into a large, non-reactive pot (such as stainless steel, glass, or enameled cast iron—do not use an aluminum or uncoated iron or cast-iron pot to avoid unpleasantly metallic-tasting pickles) and set over high heat with the bay leaves, cloves, peppercorns, and salt and bring to a boil. Meanwhile, separate the cauliflower into florets. When the vinegar comes to a boil, add the cauliflower, onions, carrots, and celery. Lower the heat and simmer for about 15 minutes. Seal the jars tightly and let them cool. Store them in a cool, dark place for a couple of weeks, and they're ready for use. 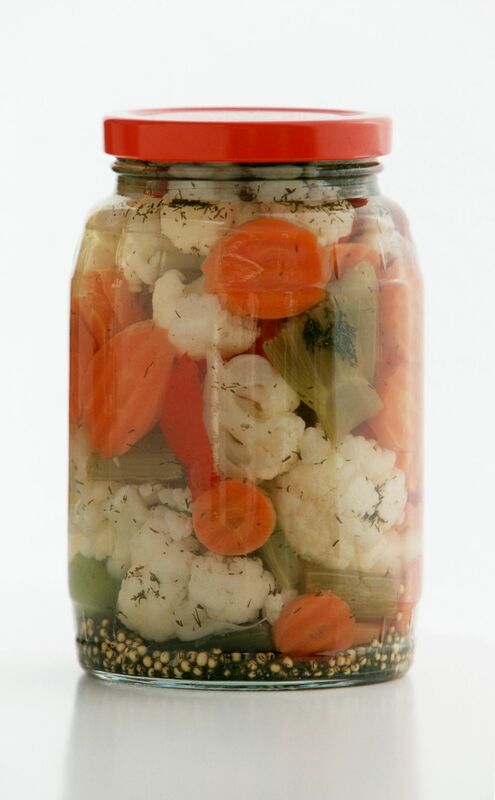 The giardiniera should have a shelf life of one year. Italian-American versions, rather than being eaten alone or as part of a mixed antipasto platter, are often used as condiments for other dishes, such as sandwiches and hot dogs, and are often made spicier with the addition of hot chile peppers. The vegetables listed in this recipe are the standard, most common ones, but you can add other things to suit your taste, for example, mushrooms, green beans, zucchini, cucumbers, hot peppers, or artichoke hearts. Feel free to experiment with the spices as well—mustard seeds, for example, would work well in this recipe.